In the last year we have been called out to look at lettuce fields showing uneven growth. The fields looked like they were not growing normally due to a cultural practice. 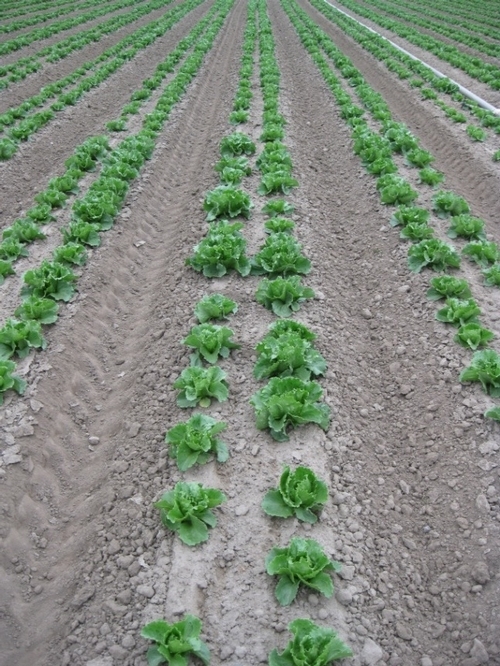 The lettuce plants in the field vary in size with normal plants interspersed with stunted plants (Photos 1 and 2). The patterns in the field do not fit with sprinkler patterns or mechanical issues because affected plants are more randomly dispersed. The pattern may fit with soil insect issues, but no soil insects were present in the affected fields. Sometimes stunted plants were more prevalent in areas that might have poor drainage. The randomness of affected plants is similar to some of the nitrogen toxicity issues that we have detected in some fields (http://ucanr.org/blogs/blogcore/postdetail.cfm?postnum=4931). In some cases the taproot of the plant is missing (a typical symptom of nitrogen toxicity), but taproots are not consistently missing and therefore the symptoms do not fit nitrogen toxicity. Upon close examination of the root system, small necrotic sections of the root are present and we were able to confirm that the lettuce was affected by black root rot disease. 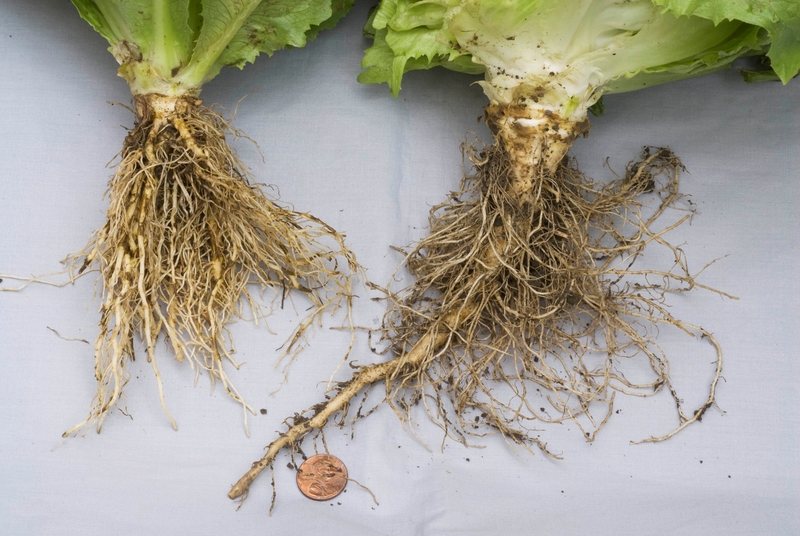 Root symptoms of black root rot of lettuce consist of numerous dark brown to black bands and lesions on small feeder and larger secondary roots (Photos 3 and 4). Internal vascular discoloration (as seen with Verticillium wilt) is absent. If severe infections occur early in the crop cycle, the lettuce seedlings will have damaged taproots and experience delayed growth, resulting in stunted, small plants that otherwise may look healthy. The stunting is usually most evident from rosette stage through crop maturity. In advanced cases, the lower leaves of the plant may turn yellow or even brown. In the Salinas Valley, black root rot has been seen to cause stunting and resulting crop loss on both iceberg and romaine cultivars. Black root rot of lettuce has been known for many years in Australia and other regions. The disease was first documented on lettuce in California in 2005. 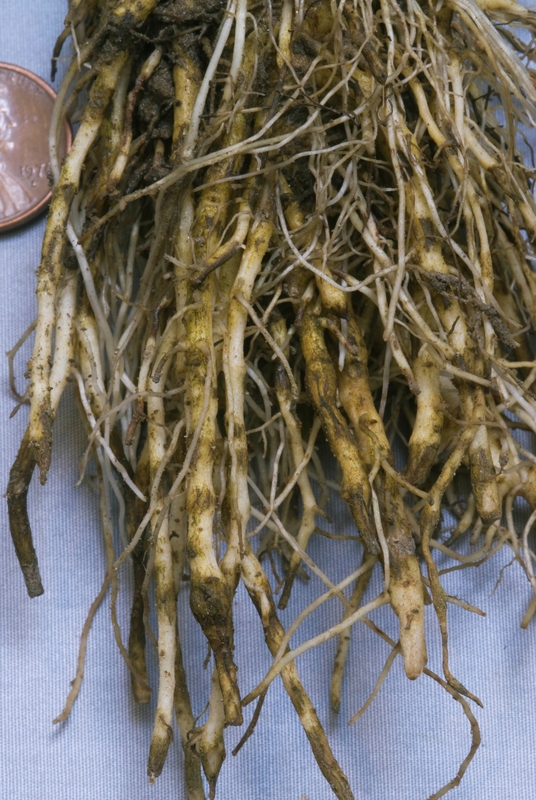 Our diagnostic lab has periodically received black root rot cases since then. Black root rot is caused by the soilborne fungus Thielaviopsis basicola. The fungus makes two types of spores, with one type being a thick walled spore (Photo 5) that resists weathering and enables the fungus to survive for long periods in the soil. This pathogen is reported to have a broad host range that includes the following vegetable crops: bean, beet, carrot, garlic, lettuce, onion, pea, pepper, tomato. In coastal California we have not found black root rot on most of these crops; black root rot disease has been confirmed only for lettuce and tomato. Differences in strains or isolates of T. basicola may exist. For example, researchers found that when inoculated onto lettuce and bean, T. basicola isolates from lettuce were very aggressive and caused significant damage. However, the same lettuce isolates caused very little damage to other known hosts. Such research indicates that T. basicola may consist of isolates having some host preferences. Industry-wide, black root rot of lettuce is a very minor problem that apparently only affects a few fields. However, growers and PCAs should be aware of this disease and notify Farm Advisors if black root rot becomes more common. For other crops, black root rot is managed by a combination of resistant cultivars, crop rotation to non-hosts, sanitation practices so as to not spread contaminated soil/mud to uninfested fields, and application of fungicides to seedlings. Photo 1. Typical pattern of Thielaviopsis basicola infection in lettuce. Photo 3: Diseased roots of lettuce affected by black root rot. Photo 4. 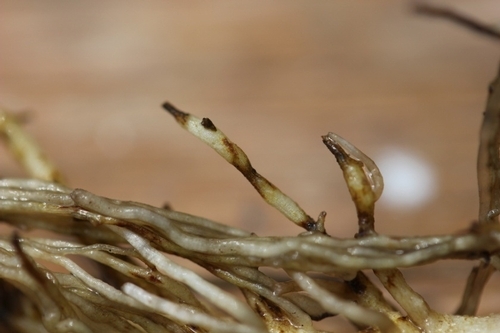 Close-up of black root rot lesion on fine feeder roots of lettuce. 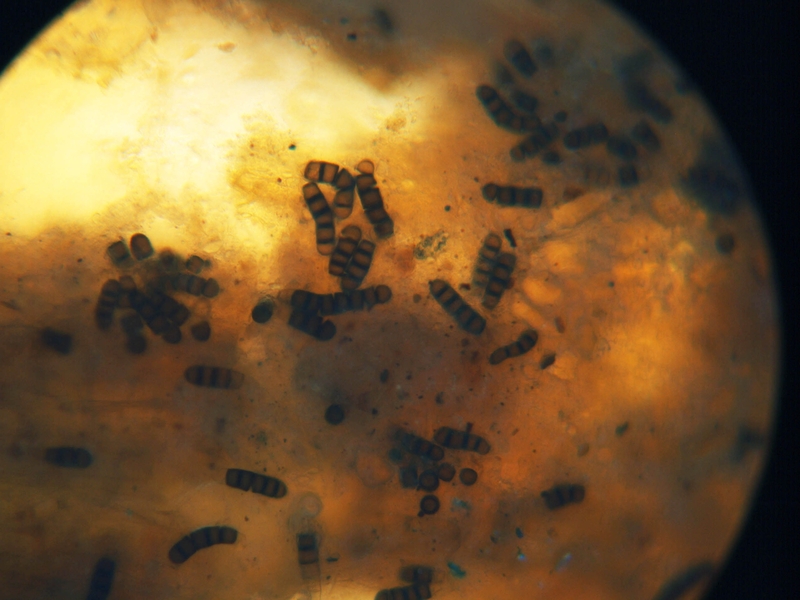 Photo 5: Dark conidia of Thielaviopsis basicola forming on lettuce root.